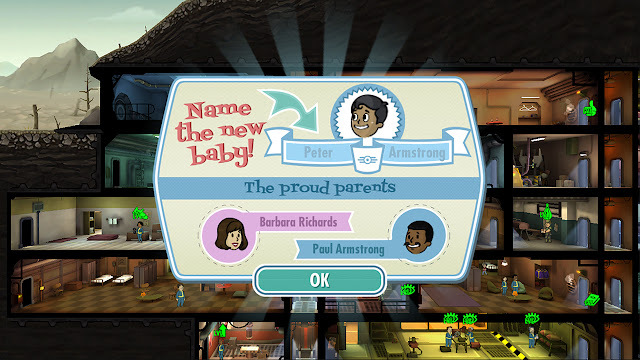 Joe here....Welcome to my review on the recent iOS release from Bethesda, Fallout Shelter. With the exponential number of downloadable games you can choose from to put on your mobile devices, I thought I would take this time and opportunity to share with you the latest one that I've played. WELCOME TO MY VAULT...THE 905 ! The first choice given to you is to decide upon on what number you give your Vault. Bethesda Game Studios is an American in-house development team at Bethesda Softworks established in 2001. Previously synonymous with parent publisher Bethesda Softworks, the studio's name and logo were established with the release of The Elder Scrolls III: Morrowind in 2002. 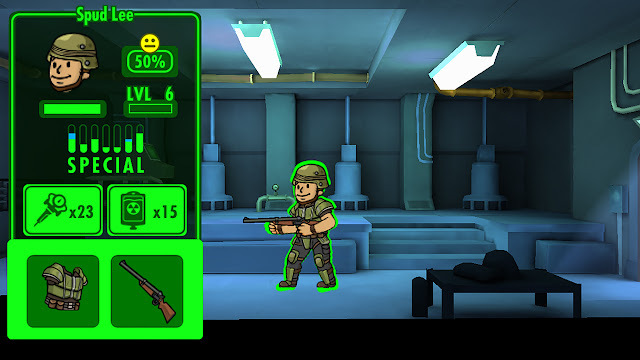 Fallout Shelter marks the first mobile release for this game developer. The Andriod release should be available in August 2015. The game offers you the obligatory helpful hints everytime you start. You know...for those of you that never read the instructions. Breaking the game down to its most simplistic task is this : develop your Vault to survive the post Apocalyptic world outside of its doors, increase the amount of Dwellers that live within your walls, and maintain their Health and Happiness. Upon being assigned Overseer of your Vault, the game directs you on how to get the ball rolling by having you create your first key essential rooms in order to survive. The icons located at the top of the screen symbolize the amount of people living in your Vault, their percentage in terms of happiness, your power, food and water supply, how many bottle caps (currency) that you have and the build/upgrade option. You will notice that some rooms are bigger than others; a good strategy to take when deciding what rooms to build where, is that you have the ability to place a maximum of three of the same rooms beside each other and having them combine into one large room, thus increasing their efficiency in producing resources for your Vault and the number of people that can work within the room. Is no one going to help the dead guy lying in the middle of the floor? Power is needed to run the rooms within your Vault. Food and water is needed to keep your people alive, along with maintaining their Happiness. It should be noted that you can have no food or water and no one will die per say, it just lowers their Health to a certain point while increasing their Radiation levels, thus making them more susceptible to Raider attacks from the outside, as well as fires and Rad Roaches from the inside. Obviously I have not been doing a good job since you can see from the Happiness meter in the above top left corner it's at 11%. As well, my Power is sitting at just under the acceptable line needed to run everything I have built. Oh, and I have no Food or Water at the moment either...(it's just like as if I was looking into my fridge at home). Here's an example of what happens with your don't have adequate Power in your Vault; the Diner and Living Quarters at the bottom left are not lit up, thus eliminating their functions to assist in expanding the Vault.If I had people in those room, they would not be producing products either. Speaking of people, when they arrive at your Vault, they come with predetermined "Specials". The higher the meter above its corresponding letter indicates which abilities that particular character is more proficient at performing. Certain rooms produce more depending on who is working them. For example, Power Generator Rooms work better if the people assigned to them have higher "S" characteristics. This also increases the overall Happiness of your Vault. A closeup of a Vault Dweller with his special stats and assigned clothing and weapon. 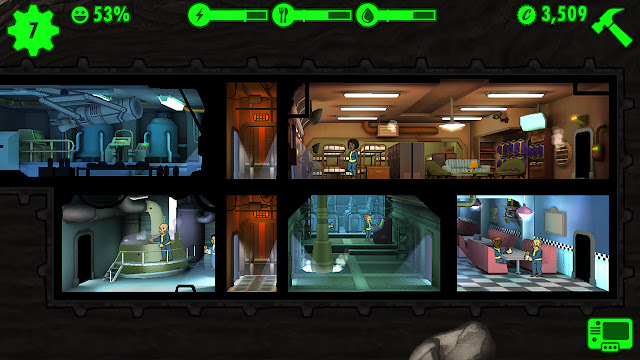 Another option to increasing the Dwellers in your Vault is to place and man and woman together in the Living Quarters. After a short period of time where the guy tries to impress the woman by flirting with her, they both run off to the back hidden bedroom and reappear moments later with the woman's belly noticably sticking out. After a certain period passes, the couples give birth to a new member of the Vault. Time has to pass before the child can become a contributing member by being able to work the rooms. Also, you shouldn't go crazy by having all the women pregnant at once because each new addition becomes a drain on Vault resources. Spread your procreating out until you are sure you can support the people you have otherwise you can quickly cripple your resources. You also have the option to send out Dwellers into the Wasteland to search for items to bring back. It's preferable to use people with high Endurance. The longer you leave these people out, the further away they travel and thus have a better chance of finding better items like clothing and weapons that they can bring back to be assigned to other Dwellers in your Vault. Return trips take half the time so if you leave you guy out exploring for 2 hours, it would take them and hour to return. They should also be equipped with a weapon, Stim Pack and Rad Pack to help protect against anything they may encounter . This was as big as I made my Vault before I got attacked by a massive Rad Roach infestation that wiped me out because I had left it unattended. Here's a list of all the rooms that you have the option of building within your Vault. You do need to be returning regularly to monitor your Dwellers progress other your resources can quickly deplete so for me that's a negative because I do have other things to do but in terms of realism it does help add depth to this portable game. In the end, for a free download, this was certainly worth it and I don't regret the time I invested into my game, though I ended up losing everybody in the end. If anything, it just teaches you what you did wrong and how to better manage running your facility in your next play through. Thanks for getting me hooked back on Fallout Bethesda since the last time I played was back in 2008 with Fallout 3. Looking forward to Fallout 4, though I may go back and play New Vegas prior to it. And for those of you waiting to play this on your Android device, let this be a lesson to you....if you had an Apple device, like you should have, then you wouldn't be waiting around to try this game out. Smarten up...and keep on collecting!